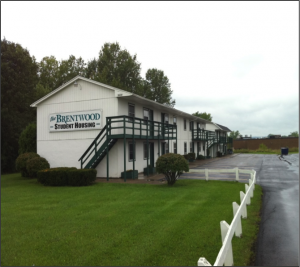 Rochester, NY – Kaman & Giunta of Pyramid’s Rochester office sell Brentwood Apartments in Canandaigua, NY. Brentwood Apartments is a 24 unit student housing complex located in Canandaigua, NY. Unlike a dormitory, The Brentwood provides full efficiency apartments. It is located less than a half mile from Finger Lakes Community College and is within walking distance of the college, movie theatre, shopping plazas, Walmart and grocery stores. This was an investment sale and was sold to a private investor. John B. Kaman and Christopher D. Giunta represented the Seller in this transaction.